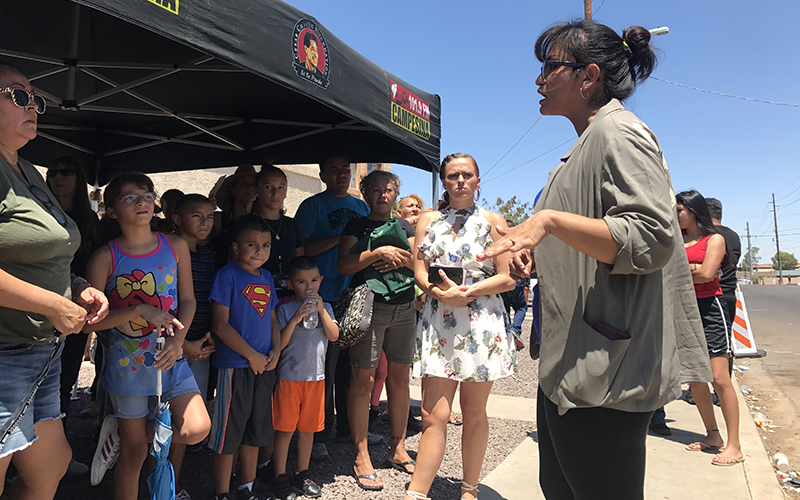 PHOENIX – First lady Melania Trump visited the Southwest Key shelter Thursday to talk to staff and children housed there. She toured a U.S. Customs and Border Protection facility in Tucson earlier in the day. 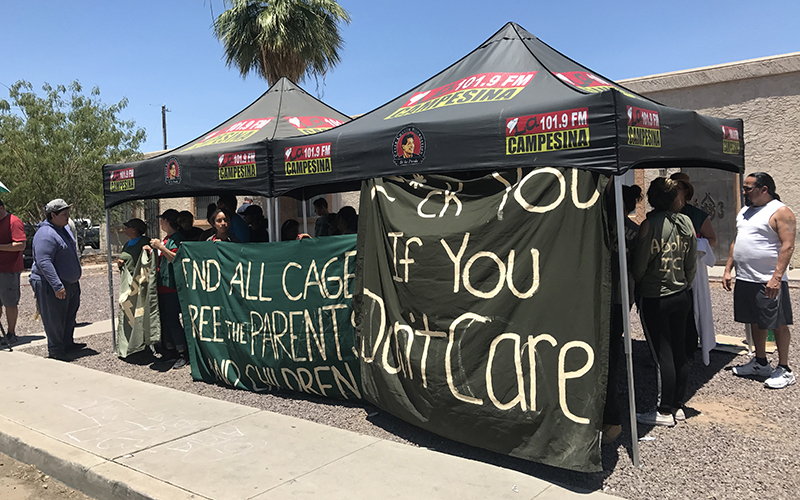 A few dozen protesters greeted Trump as she arrived at the west Phoenix nonprofit shelter for immigrant youth. Many donned olive-green attire with messages on the back, including “Abolish ICE.” The messages were written in white paint that mimicked the first lady’s now infamous “I really don’t care. Do u?” jacket she wore on her way to a Texas child-detention center earlier this month. Protestors also displayed an inflatable Donald Trump wearing a Ku Klux Klan robe. Vannia Moreno, who said her mother is an immigrant, wanted to send a message to Melania Trump. Earlier this month, President Donald Trump issued an executive order to keep undocumented immigrant families together. 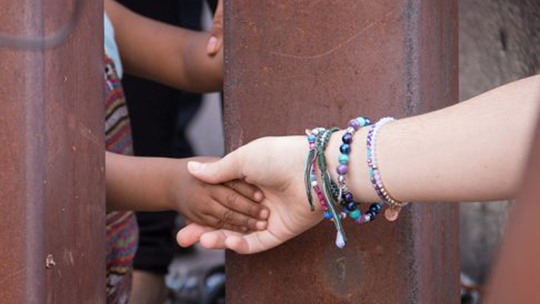 It came after weeks of criticism over his administration’s “zero tolerance” policy, which led to the separation of families at the southern border, according to an earlier Cronkite News article. His executive order did not reverse the zero-tolerance policy, and adults caught at the border will still be referred for criminal prosecution or held while their asylum claims are assessed. But reuniting families separated at the border has proven complicated. In fact, the CEO of Southwest Key, which operates programs in seven states, has waded into the family separation issue. After the motorcade arrived at the shelter, a security detail escorted the first lady through the back entrance. She stayed for about 45 minutes and did not address the protesters and news media outside. The protesters chanted in English and Spanish: “Hey, hey, ho, ho, Melania Trump has got to go” as her motorcade arrived at the facility. Demonstrators came with coolers of water and a large awning erected next to the inflatable. Melania Trump held a roundtable discussion with facility staff and visited three rooms at the shelter, where she spoke to children. She told the workers she was “here to support you,” according to the Associated Press. The facility, near 27th Avenue and Indian School Road, houses more than 100 children from infants to age 17.